A knitting schematic is an outline drawing of a knitted piece. 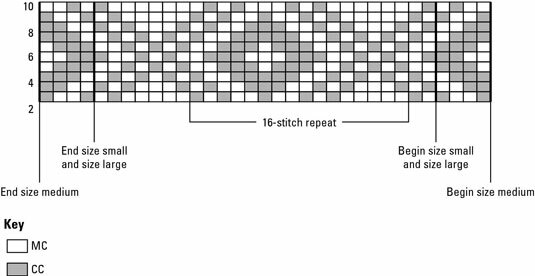 A knitting chart shows you a stitch, cable, or color pattern. Schematics and charts can also show an unusual feature of the garment. Everyone has different learning styles. If you understand written instructions better than visual charts, be assured that knitting charts can be written out in word form — and vice versa. If you have a pattern with interminable and obscure directions, read them carefully with graph paper and pencil in hand, and make yourself a chart to better understand the text. Schematics: Listed along the edges of the schematic drawing are the dimensions of the piece in each size. This is a schematic for a toggle jacket. Schematics are a big help because they show you the structure of the garment at a glance: whether the armhole is straight or shaped and whether the sleeve cap is tall and narrow or short and wide. As you become more familiar with the way actual measurements fit you, you’ll be able to tell quickly from the schematic whether you want to knit the pattern as is or make changes. Charts: On right-side rows, work the chart from right to left. On wrong-side rows, work the chart from left to right. This chart shows for a repeating color motif and indicates how you should use it.